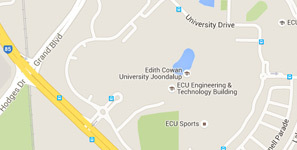 The School of Science is housed in modern, state-of-the-art facilities located on ECU’s Joondalup Campus. Students can enjoy specialist laboratories for plant ecology, plant tissue culture, analytical and environmental chemistry, molecular biology, freshwater and marine science, as well as geographic information systems. Our School also has computer and aquarium rooms, outdoor experimental aquatic facilities, glasshouses, shade houses and operates two large boats, several dinghies and a fleet of 4WD and 2WD vehicles. The School of Science is a leader in world-class learning environments and is committed to providing our students with access to the latest hardware and technologies. We have a number of dedicated laboratories with facilities for both teaching and research. Students within the school also have access to commercial software and systems through educational agreements with Microsoft, VMWare and Amazon AWS.